MADURAI: Calling up hospitals to check the availability of preferred doctors is slowly becoming a thing of the past. Hospitals, doctors, medicos and patients are adapting newer technological applications to keep them abreast with the times. While some of the hospitals having already introduced online system to check the availability of doctors and for appointments, they are now slowly turning their focus towards mobile applications. With most of the doctors and patients shifting to smart phones, the introduction of several mobile applications is coming in handy and making life easy for them. According to experts, mobile applications are becoming inseparable in the field of medicine. It makes the job simple for hospital, medicos and the doctors, they say. For a city like Madurai the introduction of mobile applications to get in touch with hospitals, is a great leap forward. One of the private hospitals in the city, Grace Kennett Foundation (GKF) is coming up with its own mobile application which can work on Android platform and has been listed in the play store. The application can be installed in a few seconds. It can give all the details including the availability of doctors, list of specialists and fixing appointments with them. Patients need not call up the hospital as all the information would be available in the handset, says Dr Augustus Samuel Dodd, medical superintendent of the hospital. The application is exclusively designed for the hospital. Patients can even get their diet over SMS using the option available in the application. The facility will be launched officially in a few days, Dr Dodd said. "It plays crucial role in sharing the details between scan centres and doctors too. During critical times to avert time consumption we directly send the report to the concerned doctors over Whatsapp," said a lab technician from the prominent lab centre. Dr K Senthil, president of Tamil Nadu Government doctors association said that the usage of mobile application has become imminent in the medical field too. Many doctors throughout the state prevalently use the applications, he said. R D Thulasiraj, executive director, Aravind Eye Care System, during a recent seminar had said, "Use of applications in the medical field is starting to catch up. 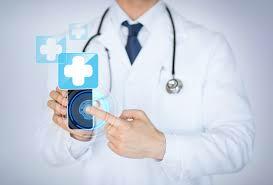 Soon doctors would start prescribing mobile apps like prescribing medicines to the patients."